Protect your Home and Roofline from just £849 with the HDG! Home / News / Protect your Home from the Elements with the HDG! From just £845, you can ensure your home is safe and protected while standing up against damage for years. Investing in a modern solution for your roofline reduces the amount of time, effort and money you’ll spend on maintenance over the years. At The Home Design Group we offer a fantastic range of maintenance-free, weather-resistant, hassle-free, uPVC fascia boards, guttering, and soffits. All in a range of styles and designs to suit any home. Check out some of the great results our customers have had below! Interested? Click here for FREE instant quote. 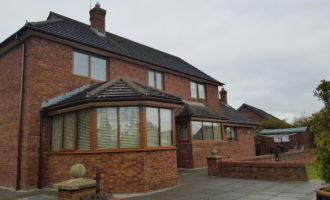 Swapping from traditional timber to uPVC materials is about more than just the look of your home. It’s about practicality. Maintaining your old soffits, fascias, guttering and woodwork is incredibly time consuming. It’s difficult and a hassle when there are more important things to be doing. The problem with older and traditional roofline materials like timber is that without regular maintenance, they make a home look neglected. Also it will eventually lead to structural damage and no one wants that! Replacing them with our great range of uPVC options offers style while saving valuable time and money. The Home Design Group’s weather-resistant, maintenance free uPVC roofline and cladding is the ultimate choice for a hassle-free home. Because time is precious, never again will you spend your valuable free-time painting, scraping, and fixing up roofline materials. Because that is going to eat into your time and money, the older they get. Our roofline products are designed to stand the test of time which is why they come with a 10 year guarantee (subject to T&Cs). The Home Design Group roofline products will give you perfect protection from the elements that you’ll never need to repaint or repair. In addition, our dry verge gable end caps can complete the look and protect your home against all weather conditions.